Pour it into the milk, and stir. This substitute will not whip. 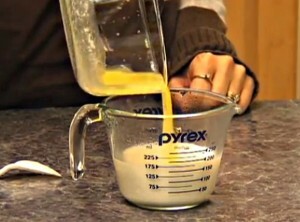 If you use low-fat milk, you will want to add 1 tablespoon of flour to thicken the mixture. Stir until well mixed. To avoid curdling... You NEVER just dump the hot and cold items together. You have to pour the butter in slowly while whisking or temper the butter and milk together a little at a time.